Want To See Lots of Byron Bay Wildlife? Here Are Our Top Tips! 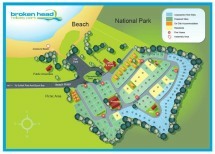 You are here:Home » Blog » Byron Bay Activities » Want To See Lots of Byron Bay Wildlife? Here Are Our Top Tips! If you happen to be an animal lover, then come to Byron Bay where you will have ample opportunity to view Byron Bay wildlife in their natural settings. Whether you want to come to Byron Bay for whale watching, take a snorkeling trip and swim with the fish or you want to hike into the Hinterlands and catch a glimpse of a wild brush turkey, you can get your fill of animals while on holiday here. Byron Bay is considered one of the best places in the country to view migrating whales. Whales migrate past Byron Bay from May to November, and there are several excellent vantage points in the area from which to catch the whales in action. First off, head to the historic Cape Byron Lighthouse—this is a must-do on any Bryon Bay holiday so why not cross off two things off your list? In particular, you should head to the Lighthouse or the Captain Cook lookout to have the best chances of seeing the whales. Another option for whale watching is right in our backyard—the Broken Head Nature Reserve where you can follow the Three Sisters walking trail to a lookout where people often spot whales. While you’re there, you might catch a glimpse of another animal, a non-sea dwelling one: a white-bellied sea eagle, which can be seen diving into the water for food. Also, Byron Bay whale watching can be made easier if you take a tour. These guides know where to go to make sure you see a whale. When it comes to Byron Bay whale watching tours, there are many options, but the largest are Whale Watching Byron Bay and Blue Bay Whale Watching. Both Byron Bay activities run about two to three hours and guarantee you’ll see a whale. Byron Bay is known to have a large population of bottlenose dolphins, so much so that you’ll almost always see some swimming by if hang around some of the vantage points like hills around Little Wategos and Wategos beaches. If you want to get up close to the dolphins in Byron Bay, you should contact Go Sea Kayak Bryon Bay, which provides a tour around Byron Bay Marine Park. This popular Byron Bay activity runs about three hours and allows you to go kayaking with dolphins in Byron Bay. One of the best ways to view turtles and other marine life is snorkeling in Byron Bay. Julian Rocks Marine Reserve, just five minutes from Cape Byron Bay, is home to more than 400 types of tropical fish, three species of sea turtles, rays and many more marine animals. The reserve is rated one of the best places in all of Australia to snorkel and dive so don’t miss your chance to visit Julian Rocks while you’re in Byron Bay. If you head to the Whian Whian Forest Drive (and you’ll want to use a car as it goes for 30 km), there are side roads with signs saying ‘koalas are nearby’, so go slow as they are hard to find. There are quite a few koalas in the Byron Bay area, but the population has decreased significantly in recent years due loss of habitats and other threats so the Byron Bay area has committed to helping increase the koala population through the Koala Connections project. Perhaps it will be easier in the future to spot these beloved animals! If you head to Nightcap National Park’s rainforest, one of the best land-based Byron Bay activities, you most likely will be able to see several species of Byron Bay wildlife. Minyon Falls: At the picnic area, you might catch a glimpse of peregrine falcons in the sky or brush turkeys on the ground. The rainforest of the park is a protected habitat for quite a few threatened animals such as the red goshawk, rufous scrub bird, sooty and masked owls and regent bowerbirds. Or you can go on a Byron Bay Night Vision Walk. While wearing night vision goggles, guests on this night tour will view Byron Bay wildlife during some of its peak active time and even have a chance to view a colony of glow worms. Often tour goers see possums, bandicoots, tawny frogmouths and even sometimes an owl or koala. This same company offers a daytime Wildlife Tour that often results in guests seeing koala, kangaroo, wallaby, flying fox and birds. Is Byron Bay the best place for whale watching and wildlife? Book your stay at Broken Head and come see the Byron Bay wildlife! If you love seeing wildlife in the area you are staying for your holiday, then book a holiday in Byron Bay soon. This area doesn’t disappoint when it comes to wildlife both in the water and on land, you’re sure to get your fill. Book your stay at Broken Head Holiday Park and stay at one of our campsites, beach cabins or beach shacks so you can listen to the Byron Bay wildlife in our quiet surroundings at night and then you can see them during the day.